As the Orchid school proudly celebrates 10 years of its existence, the members of the Orchid family feel a warm glow of pride. Owing to this past successful decade, the entire school is abuzz with celebrations which will pan over three days. We wanted to start the festivities with a big bang, and what a great start indeed it was! 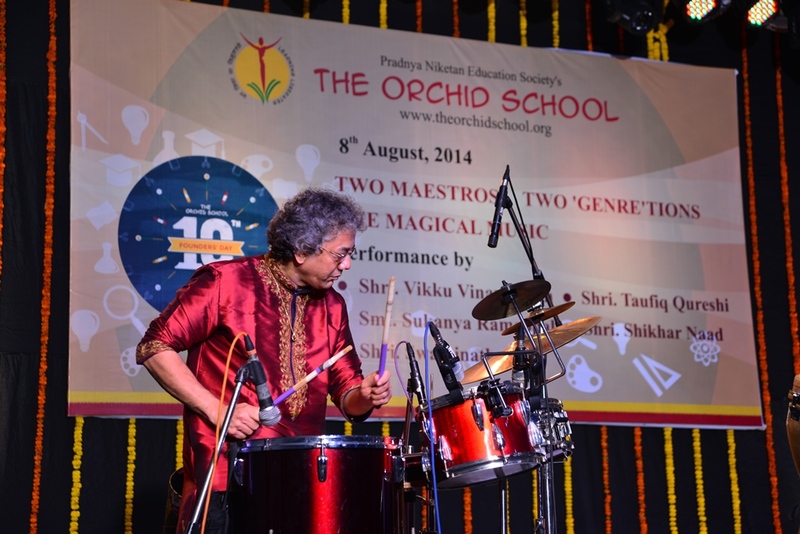 The audience was teeming with a most enthusiastic crowd of parents, children, staff and members of the Orchid School and some very esteemed guests such as Shrimati Sukanya Ramgopal, Shri Swaminathan, Board Members of the Orchid School and families among the audience. While we knew that there would be no better time, the evening began with extending our hearty congratulations with the Academic Achievers Awards to the students who appeared the Class X CBSE exams in 2014 and scored a CGPA of 10. We are so proud of them! As we know, this year’s Founder’s day is also dedicated to individuals who through their exemplary work and contribution to society are our role models so that our young students may emulate them and rise as achievers, and so we may thank them all. On that note, Lakshmi di introduced, thanked and felicitated Dr, Raghunath Mashelkar, who is the National Research Professor and President of Global Research Alliance with a token of appreciation. As part of tradition, Orchid pays homage to the rich treasure trove of fine arts on the occasion of Founder’s day. This evening was therefore dedicated to great artists of the past and present. The performances were created in a manner that brings to life all these artists and at the same time provides a great platform to all our superbly talented students to display their talent to the audience. The evening began student-narrators welcoming the audience and then inviting the melodious young voices of the students with the Indian Classical vocals. 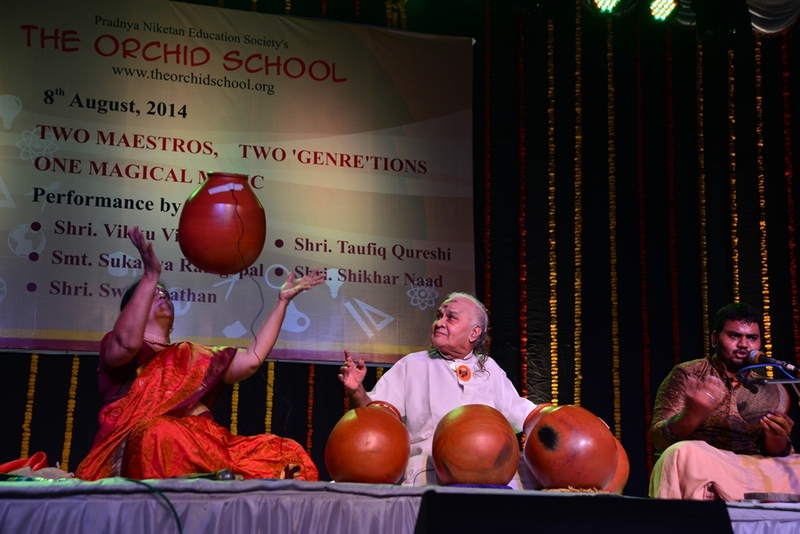 Their foot-tapping rendition of ‘Rang na Daro’ to a fusion of percussion instruments set the mood for the evening. This was followed by a graceful performance of Bharat Natyam by our students which garnered great applause. The performance was seamlessly fused to introduce another style of dance, that of Ballet, to the audience. Our talented young ballerinas have definitely stolen the hearts of many with their lithe and elegant movements. 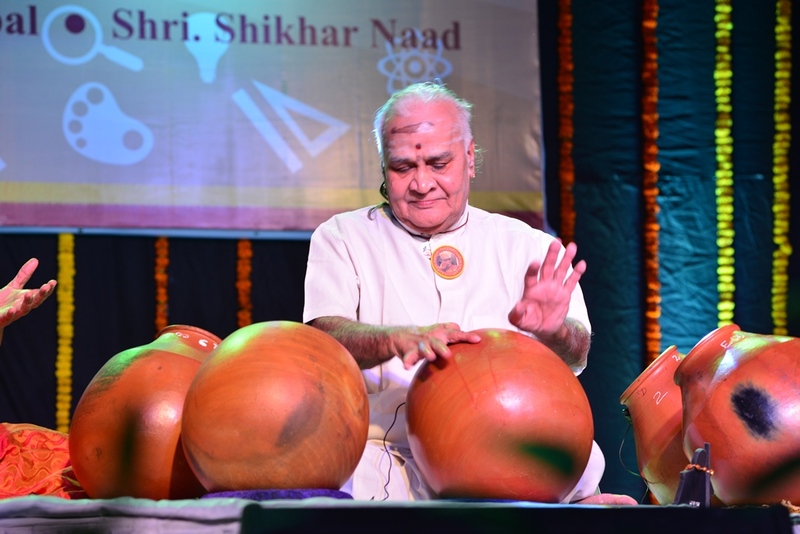 This merged into the more Contemporary style of dance as a tribute to Shri Uday Shankar. The dancers caused the audience to gasp in excitement at every lift and fall while they moved gracefully across the stage to the music. Then ensued a most rhythmic performance by our young tabla players and as they played, we experienced not only great music but also the passion that was evident on their beaming faces. 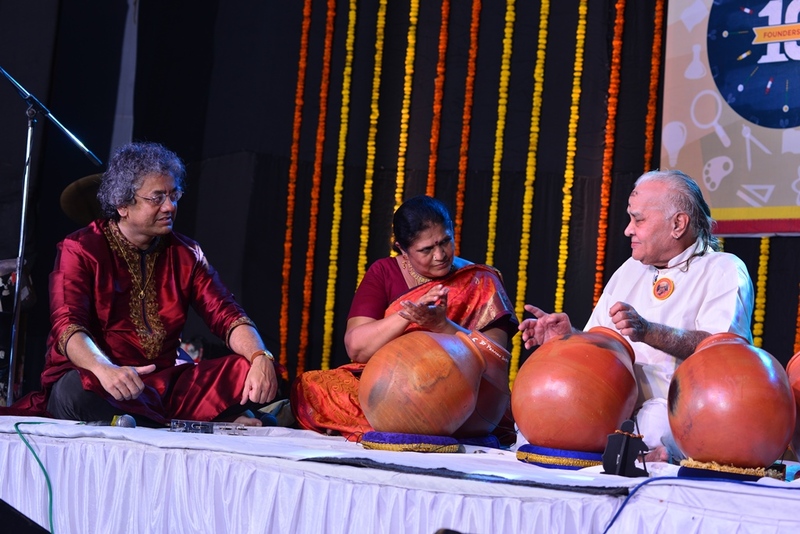 By then we had welcomed into the audience none other than Shri Taufiq Qureshi with his son Shri Shikhar Naad. It then seemed most natural to ask them to share a few words about their passion for the art, their revered guru and father and grandfather Ustaad Alla Rakha and glimpses of their life experiences. An already delighted audience then got to witness the Choir pay tribute to A. R Rahman and some of his compositions. The beautiful voices, the outstanding key board solo and the amazing band made the performance most enchanting. The last performances were those of the junior and senior percussion groups. It would be a gross understatement here to say that it was anything short of brilliant. 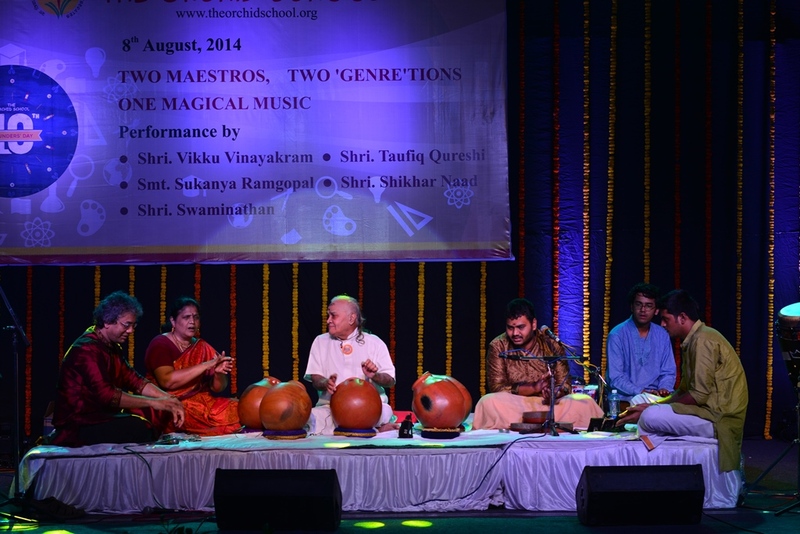 Seeing Taufiq Qureshi and Shikhar Naad tap their fingers and nod their heads in sync with the music was acknowledgement enough to these children, and a standing ovation from the audience sealed it. None of us were prepared for what was to happen next. The students were successful in coaxing Qureshi ji, Shikhar ji, Swaminathan ji and Sukanya ji to come up on stage and perform with them! The next 15 minutes was pure happiness as music filled the air with their jugal-bandi and our students joined in the rhythm. As this impromptu and brief, yet amazing performance came to an end, it took some time for the crowd to settle down. What else could one expect after such an experience! Our students then took the stage again to perform the finale, a beautiful piece titled ‘African Fantasy’ as all 150 odd student-performers of the night gathered up on stage to take a bow and bid adieu to the audience. While our students who were in complete awe of the performers crowded around Qureshi ji and the others, Lakshmi di and Shilpa di played guards and whisked them away as the crowd kept longing for more with bright smiles across every single face. We all take back these memories to cherish forever. The excitement of what is yet to come over the next two days knows no bounds!